The SUSY 2012 conference starts in Beijing today. It is the biggest supersymmetry conference of the year and we expect to see the latest results using the 5/fb gathered in 2012 at 8 TeV before the last technical stop. Actually at least some of the results have already appeared with three new conference notes from ATLAS this morning here, here and here. CMS released their results earlier, see their twiki page . Because of the high masses being searched for the extra TeV of energy over last year’s 7 TeV actually provides 2 to 3 rimes as much sensitivity, so even without combining the new results with the similar amount of data collected last year we get significantly better depth. Sadly there is nothing yet observed in these notes beyond standard model expectations. This is disappointing but there may be other searches released later and there are always places for SUSY to hide from the LHC. The green line is the standard model expectation, blue circles are CMS and red are ATLAS. Black is the unofficial combination. The results are comparable to throwing 4 dice and getting four sixes. Was it a fluke or were the dice loaded, and if so, how? If the effect is not statistical it could easily be a combination of systematic errors. This would most likely be due to errors in the theoretical calculations that would affect both experiments. (TS pointed out this paper which fingers QCD uncertainties) Many people would suggest we wait for the dice to be rolled again and then look at systematics more carefully before taking this too seriously. However, by time that has happened the long shutdown will be on us. If there is a possibility for something to be seen here it makes sense to look at what it could be. Theorists might then make predictions that could be tested this year if triggers can be adjusted in time. I am assuming that the excess in the diphoton channel is due to extra particles that affect the Higgs decay loop and that the production rate via gluon fusion is close to SM predictions. This may be wrong but it is what the data looks like so far. That being the case, the Higgs diphoton loop can most easily be enhanced if there is a new charged particle that adds to the loop. A boson would probably add to the cross-section while a fermion would subtract from it but some knowledgeable theorists say that “vector-like” fermions are also a possibility and who am I to argue. It must be colourless to avoid spoiling the gluon fusion production rate. It could carry lepton number which would affect its decay possibilities. Mass would be greater than 105 GeV otherwise it would be produced via mediated photons at LEP, but less than about 300 GeV to have a significant affect on the loop. Best candidates are scalar leptons like the stau or charged scalars like a charged Higgs, but vectors such as a W’ are also possible. These things have been searched for and already excluded in the required mass range, but only under model specific assumptions. Hadron colliders ahve big blind spots especially when particles decay via jets. There is still hope that something is being missed. This entry was posted on Monday, August 13th, 2012 at 10:58 am and is filed under Large Hadron Collider, Supersymmetry. You can follow any responses to this entry through the RSS 2.0 feed. Both comments and pings are currently closed. 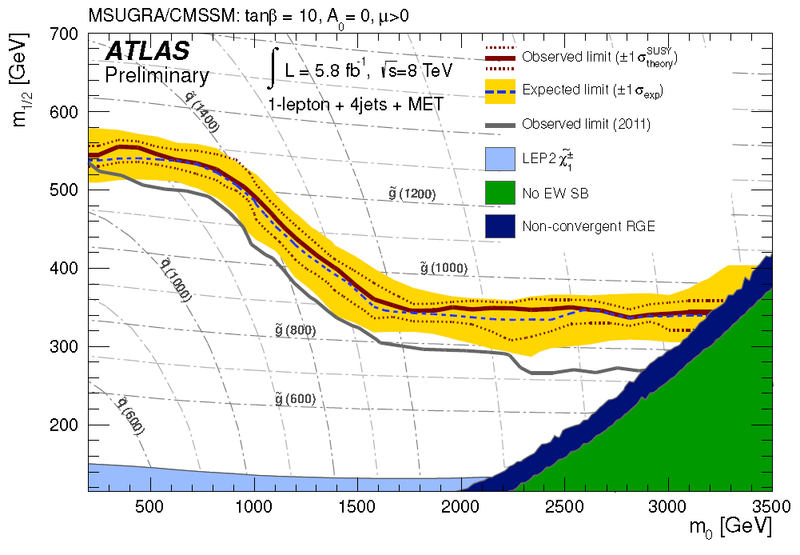 There are also more new ATLAS results here: https://twiki.cern.ch/twiki/bin/view/AtlasPublic/SupersymmetryPublicResults. This includes 10 new CONF notes, 8 of which are with 8 TeV data. Is there anywhere we can find the slides from SUSY12? I haven’t found them on the main page for the conference and I haven’t yet managed to find anything on Indico for the conference. Sorry, maybe only 4 are with 8 TeV data. Thanks for the link. Not sure if and where talks will be posted but they have just started so we may see them later. This two-gamma excess is interesting. My own identification for Higgs like state – which I dare see as final;-) – is as a pseudoscalar (PS). The action responsible for decays would be the interaction term in gauged kinetic term of action for PS and a linear coupling to electroweak instanton density. The electromagnetic part of instanton term could be responsible for the production of PSs in strong non-orthogonal electric and magnetic fields. Instanton term would induce anomalously high production of gamma pairs and also Z and W pairs. The production rate for gamma pairs would be about 1.6 times higher than in standard model if one directly scales from the case of ordinary pion. The counterpart of Higgs mechanism gives mass for weak gauge bosons but not for fermions receiving the dominant contribution to their masses by p-adic thermodynamics. PS VEV is induced by potential containing only a non-tachyonic mass squared term and linear instanton term but no phi^4 term. Fermions would no have direct coupling to the pion: this would save from from the hierarchy problem so that there is no motivation for standard SUSY in TGD. As a matter fact, the progress in the understanding of field equations of TGD demonstrated that although SUSY is replaced with infinite-D super-conformal symmetry standard SUSY does not have any TGD counterpart: clear also from the fact that Majorana spinors are not possible in M^4xCP_2. 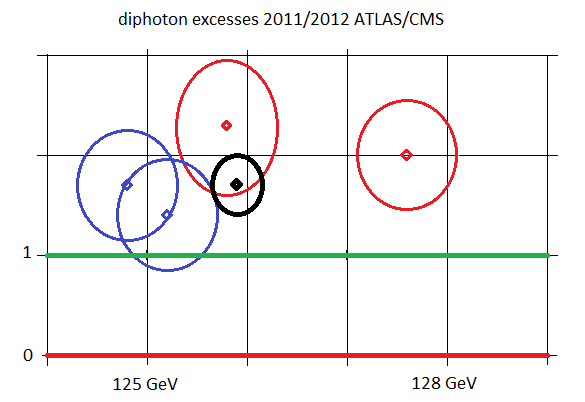 PS has only single state surviving Higgs mechanism and cannot be the pion of M_89 hadron physics predicted by TGD. The identification is what I call Euclidian pion assignable to flux tube connecting throats of wormhole contact. W and Z combine to form the analog of Euclidian rho meson. In Euclidian regions of space-time instanton term is always non-vanishing but vanishes in Minkowskian regions (so that “Minkowskian” pion does not suffer Higgs mechanism). The states of Minkowskian pion are analogous to polarization states of 8-D gauge boson in CP_2 directions and there are only 3 of them since CP_2 projection for Minkowskian preferred extremals is 3-D at most. We will soon know whether the new particle decays to fermion pairs with the rate predicted by the standard model or not. I expect that it does not. Second prediction is genuine M_89 pion state around 140 GeV for which there are indications also from Fermi. See my blog article at http://matpitka.blogspot.fi/2012/08/cautious-conclusions-concerning-gauge.html and the longer article at http://tgdtheory.com/public_html/articles/higgshuping.pdf . A long time back, mathematics gave us a language where one can take multiple factors to account that result into a given action in nature. It was a victory over linguistic logic, that could basically establish one to one logic. One to one logic broke understanding of nature into pieces, and that is the reason we started with multiple theories. However, science took a turn, and made mathematics an absolute truth. The computation and manipulation using various operators became truth statements in themselves. I belive this is resulting into many theories and perdictions which are later verified by targeted scientific efforts. This is because there is an element of truth as well as fiction in them. I believe it is mistake, we are making at this crucial junction in history of science. We need top re-establish the beauty in nature and our thought process. Beauty is one which is easy on human brain. I am not sure that there is anything to be sad about. Decent heuristic model-building has been upheld. Postmodern pseudo-science has been awarded nature’s equivalent of the Bronx cheer. I am not bothered that they have not confirmed any particular models. I am concerned that there has been no evidience of physics beyond the standard model. If this continues it will make it harder to discover the nature of dark matter, inflation, unification etc. It will also make it hard to decide which next generation collider to build if any. I agree, continuation of observation in this field is important. It is through the collection of knowledge, we are able to determine the common elements and bring forward these elements in simple statements – laws of nature. It is important, once technology is established, to continue and support these experiments. It is through them nature will reveal to us. Possibly we will move away or refine the standrad model and string theory. May be there is a explaination besides standard model rather than beyond standard model. . In my understanding – most of fundamental laws in phyics (known before 1970) can be encapsulated in one statement ‘Space Contains Energy’. If we are unwilling to seriously question the prevailing assumptions that have led to the current dead-end in theoretical physics, then it is unlikely that the correct identity of dark matter will be recognized, or that the path to unifying QM and GR will be identified. On a more positive note, even if the theoretical physics community is unwilling to consider new assumptions and new approaches to understanding nature, observations might force them to see the light. Personally, I am hoping that when the NuSTAR X-ray telescope starts churning out scientific data (like a stellar-mass black hole census) then we might receive some guidance from nature. Microlensing research is also poised to rock the boat. The LHC results have been quite eloquent. But some are in serious denial. Maybe money would be better spent elsewhere. For example, on neutrinoless double beta decay experiments (with both test Majorana mass theories and provide an important bound on the maximal energy scale of a large class of SUSY models that have been bounded to minimum energies by LHC), experiments more precisely bounding proton decay rates (which remains a characteristic component of many BSM unification experiments), experiments oriented to determining more accurately the elements of the PMNS matrix and neutrino masses (Standard Model neutrino physics constants are know only very vaguely and precision there greatly bounds unification efforts), precision GR tests, more precise determination of the value of the gravitational constant “G”, long range entanglement studies that can probe issues to the extent to which space-time is completely local and causal, direct dark matter detection experiments, and improved computing power to analyze data from astronomy re dark matter and from existing colliders with more precise Standard Model backgrounds that would reduce systemic error and increase the power of the observations that have already been made or are being made. One big collider budget can fund a lot of medium sized physics experiments. I am not at all certain that fundamental physics wouldn’t be well served by a collider physics breather after the LHC for while. Colliders are very expensive and seem to have diminishing marginal utility for fundamental physics. It is a bit like investing more money in maps when you haven’t figured out how to calibrate your compass correctly yet. The physics that the LHC can test is pretty well explored (or will be at the end of the LHC’s run, anyway) compared to lots of less precisely determined components of fundamental physics. We should put our money into the problems that have the greatest potential to fill in empty squares in the crossword puzzle. I’ve impatiently waited for you to come here and t**** below Phil’s nice article about the latest SUSY results … ! 1.The natural balance in consumption and creation of space. 3. CBR is also attributed to the same phenomenon – cooling of photons as they travel thru space. (Note Energy is not conserved in PicoPhysics, matter also known as knergy is. Energy is conserved in normal interactions due to relaxation factor). 4. In picophysics – gravitational attraction, Cosmological redshift, Cosmic background radiation and dark matter are strongly related to each other and result from non-conservation characteristics of space. Phil, you say that you are “… concerned that there has been no evidence of physics beyond the standard model …”. showing similar possible low peaks for ZZ to 4l. with cross section of 25 percent of SM Higgs ? satisfy your desire for “physics beyond the standard model” ? Of course it would be fantastic to see extra signals in this data. Everyone would be very excited about it. As you know, as soon as you start looking through all the channels and across all the mass range you introduce a big look elsewhere effect and it would be surprising if there were not a few interesting excesses somewhere. You would need about 4-sigma locally before it started to raise eyebrows. At the moment nothing stands out above what you would expect. If they multiply the amount of data by 3 some of the peaks could increase in significance but not enough to make people excited I think. Anything that is going to be convincing by the end of the year would already be showing about 2.5 sigma global significance now. The only thing that qualifies for that is the diphoton enhancment at the Higgs mass that I have been talking about. People need to be reminded over and over again that we are just beginning to uncover the physics of the TeV scale at the LHC. The diphoton enhancement may be only a baby step (if confirmed as such) and many surprises, a way or another, are bound to happen in the not-so-distant future. Thanks Erwin for saying that I had also intention to say;-). They are only beginning to analyze the decay rates of the Higgs like particle and decay rates to fermion pairs might bring a huge surprise. Background is so huge that one must precisely know what one is searching for if one wants to find anything. Searching signals for wrong theories gives nothing and might lead to the wrong conclusion that there is no new physics there. There is a general argument for the presence of new physics: hierarchy problem for Higgs. The new physics does not seem to be standard SUSY. What is it then? We should not forget how theory dependent the analysis of data and even the collection of data is (huge amounts of data must be thrown away and this is done on basis of some theoretical criteria!). I believe [link:picphysics.org] PicoPhysics [/link] is the new physics with answer in the statement ‘Space Contains Matter’ here matter signifies a reality that is conserved and space – that is not. The statement describes the [link:fqxi.org/community/forum/topic/1326] Five Dimensions of universe [/link] in all its manifestations. The name picophysics for new thought process has been arrived considering the scope of analysis being at sub elementary particle level, where there exists no characteristic to differentiate between identities of same reality. The differences arise as a result of interaction between identities as per laws that are seen as derivative/corollaries to unary law – space contains matter. This capability to explain nature is embedded into unary law through clarification of conservation concept and understanding the conservation based contrast between space and matter.